Combining an easy-to-use diagramming front end for reliability block diagram development with a powerful behind-the-scenes calculation engine. The Relyence RBD software offers a comprehensive platform for modeling complex systems, including those incorporating redundancy, and computing a wide range of metrics with its highly capable mathematical engine. Relyence Reliability Block Diagram software computes all your most important reliability and availability metrics with speed and accuracy. The mathematical engine is intelligent and optimized to perform calculations in the most efficient way. Our software supports the creation of complex system models, including redundant components and branches, links to Relyence Reliability Prediction, and computes a wide array of metrics using Monte Carlo simulation techniques. Relyence’s RBD software is a complete reliability block diagram software tool. The visual diagramming front-end provides an easy-to-use interface for creating impressive and organized graphic system models. The built-in smart layout feature expertly configures and manages your model layout and connections. Relyence’s Reliability Block Diagram software is a powerful platform for system modeling, including complex systems incorporating redundancy. The calculation engine includes a Monte Carlo simulation engine employed when needed for accurate analysis, and provides results for all your most important reliability and availability metrics. 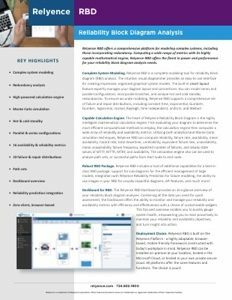 Relyence’s comprehensive platform for system modeling is rounded out with a robust feature set to enhance your reliability block diagram software, including flexible report generation, features to manage and organize your diagrams, integration with your reliability prediction analyses, and customizable dashboards for high-level overviews. Take us for a test drive with an RBD software free trial. No commitment. No hassle. Just sign up today to see Relyence in action. Our reliability block diagram software free trial requires no download or installation and includes all the features of our complete RBD package. Or, if you’d like a personalized demo, feel free to call our team today to schedule a time. You won’t be disappointed! Discover the unparalleled features that make Relyence Reliability Block Diagram software the choice tool for system modeling. Relyence RBD combines a visual and friendly interface for creating Reliability Block Diagrams with a powerful calculation engine. Used to analyze products that contain redundant components, our software allows you to perform trade-off studies in order to evaluate the benefits of incorporating redundancy. Relyence Reliability Block Diagram employs a highly intelligent calculation engine that first determines the most efficient methods to use for system analysis. Once evaluated, the Relyence’s mathematical engine, including a built-in Monte Carlo simulator, is engaged and computes a wide choice of reliability metrics. Relyence’s RBD software is easily incorporated with your existing systems. Including flexible report creation that support a variety of output formats, API functionality support, and direct linkage to your reliability prediction analyses for failure data, Relyence is designed to be an integral part of your product management lifecycle. Relyence RBD Software’s Dashboard gathers and organizes your data for a holistic overview. View the path sets, repairable components, components with the highest unreliability, components with the highest unavailability, and much more. Built with team concepts in mind, Relyence RBD allows access to your analyses anytime, anywhere, and on any device – including your mobile devices. Collaboration and connectivity are at the heart of the Relyence Reliability Block Diagram software. Relyence RBD is also available as part of the Relyence Studio Platform – our fully integrated platform for all your reliability and quality tasks. Data integration is seamless and cross-module dashboards provide an all encompassing overview. 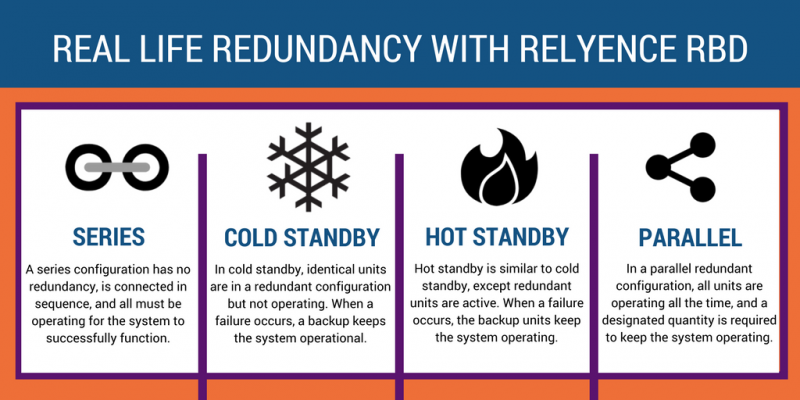 Relyence RBD supports the full range of real-life redundancy variations: Series, Cold Standby, Hot Standby, and Parallel. What is a Reliability Block Diagram? Reliability Block Diagram analysis, typically abbreviated as RBD, is a methodology for assessing the failure or success paths through a complex system. RBDs are created in a visual format, using blocks to represent components or elements of a system, and then connecting those block using connector lines to indicate their relationships to one another. Oftentimes, RBDs are used to assess the impact of redundant components, or redundant paths in a system. Redundancy in terms of RBD analysis means that when a component or path fails, a secondary component or path can take over to keep the system up and running. RBD software tools offer many advantages. 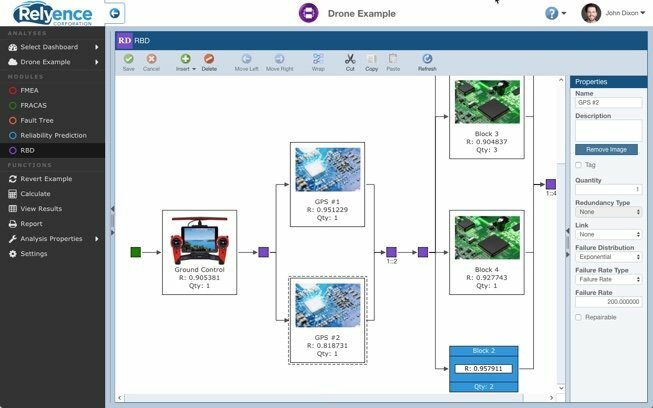 First, RBD software tools enable you to provide a visual layout of your product, process, or system, including redundant components, branches, and switch delays and probabilities. This visual depiction is not only advantageous for understanding a complex system model, but is necessary in order to accurately compute availability metrics. Secondly, RBD computational engines use known mathematical techniques, sometimes including Monte Carlo simulation, to provide metrics that are difficult, or perhaps impossible, to compute manually. The speed and accuracy provided with complete RBD analysis tools is unmatched. Lastly, RBDs are inherently complex. Managing the evaluation of reliability metrics of complete systems without a software tool is unwieldy and error-prone. Start Your RBD Software Free Trial! When it comes to reliability modeling and analysis, your organization can’t afford to opt for anything but the best. That’s why Relyence is a leader in RBD software – offering one unified tool that includes system modeling, analytics, integration options, and an intuitive dashboard. It also allows for anytime, anywhere access and is available as part of the Relyence Studio Platform. Begin your RBD free trial today! Check out our blog for more information on reliability block diagrams, Relyence RBD, and other reliability & quality topics.